Note: Do you think you're having a deja vu moment? and the third is to be kind." I have some very dear friends whose son falls into the 1 in 68 category. He was diagnosed with autism when he was 2 years old. From medical, to homeopathic, to nutritional, to light therapy, to mineral detox treatments, this family has been proactive from day one. Since then, they have been on the autism version of Mr. Toad's Wild Ride. Yet through it all they do their best to live a "normal" life. Like I said before, autism is a family disease. From the grandparents to the youngest sibling, I'm sure each member of the family could write a book on how autism has affected them. Today I'd like to share with you a speech Alexis wrote and presented at her school last year. Alexis, aka Lexie, is 10 years old, the middle child (Something I can relate to.) Although we live in the same neck of the woods, we don't see each other often. Instead we exchange texts and emails. Last fall, Lexie's grandmother, Barbara, sent me Lexi's speech. Much to everyone's chagrin, Lexie took home the 3rd place award, not first. Lexie and I are kindred spirits. When I was in the 6th grade. I loved writing and telling stories. I memorized the Gettysburg Address and recited (while others read it, I might add) it in front of a group of judges who picked me to make the 6th Grade graduation speech. When I talked to Lexie, I remembered how it felt to be full of ideas and not afraid to share them. I wanted to be 10 again! ME: Lexie, what made you decide to write a speech about autism? Lexie: Because it affects my life every day. ME: Who else gave speeches? Lexie: All 4th and 5th graders had to give a speech in front of their class. Then the first in each class spoke in front of the whole school. ME: Yikes! Were you nervous? Lexie: No. I was excited. ME: And you came in third place? Lexie: Yes. I got a ribbon for coming in first in my class, and a medal for third in the school. Lexie: I would love to do it again because I know what I could make better. ME: What's your favorite subject? Lexie: I like writing limericks. ME: Limericks? Do you have one to share? This was a beautiful land. ME: Wow. That was great. ME: So do you want to be a writer when you grow up? Lexie: No, it's just a hobby. I want to be a police officer when I grow up. Because Hawaii 50 is my favorite show. ME: Thanks so much Lexie, for talking to me and letting me share your speech. I'm really proud of you. Is there anything else you'd like to tell people about living with autism? Lexie: Even though my mom and dad try to keep autism from ruling our lives I know that it is always going to be there and that's okay. I can't imagine my life without my brother the good and the bad. Hello, my name is Alexis and I understand autism. I understand it because I live with it within my family. For me it is a daily way of life and I have learned to be accepting of others.Autism is called a broad spectrum disorder which means it has a wide range of problems like a big rainbow. Within that rainbow a lot of different behaviors show up. Today one out of four children will be born with autism and four times as many boys will have it. I think a good way to explain autism is to say that people with autism see the world a little differently than we do. Sometimes their brains don’t process or understand information from the world in a normal way. It is as if they are getting signals confused. Autism usually appears in the first three years of life. It affects the brains normal development of social and communication skills. Kids with autism have trouble communicating, making friends and often have trouble with their senses. This means ordinary sights, sounds, smells, tastes, and touches may be either painful or super sensitive to them. Even though it is hard for them to make friends, they want to have friends like everyone else. This means the rest of us have to find ways to help understand and connect with them. Autistic kids have a lot of gifts and talent to share but their brains won’t let them show it in a way we are used to. Many people with autism are geniuses at music, painting or doing complicated math and science work. Adults with autism usually lead successful lives.Remember, it is important to distinguish the difference between I won’t and I can’t with autism. Kids with autism are still kids. They get their feelings hurt just like you and me. Be kind! Be Kind. Every time I read that, I think how kindness really is solution to so many of the world's problems. And I love that a 10 year old embraces the concept when so many adults seem to have forgotten it. Kindness may not cure autism, or fix the economy, or feed the poor, but it sure goes a long way towards making life easier for everyone. I think Lexi's on to something. Please, when all else fails, be kind. Why not go out for dinner at Chili's? Be sure to click on the link below and read the Broken Cheeseburger Story. It is a great example of what I've been suggesting about being present and aware in every moment. It's possible the waitress in the story was having a fight with her husband before work, or maybe her kids were sick, or maybe she had a large, rowdy party at another table. Who knows? What we do know is this Lauren, paid close attention to the little girl who couldn't eat her cheeseburger because it was broken. She used her heart and her head, as well as her hands to give this family her best service. Let's hear it for Lauren and the rest of the Chili's, staff who turned what could have been a not so good dining experience into a memorable one . And let's plan on eating at Chili's next Monday. Easy, peasy, if you ask me. April is Autism Awareness month. CLICK HERE to read the 'Broken Cheeseburger' story and see what inspired Chili's to support this cause. 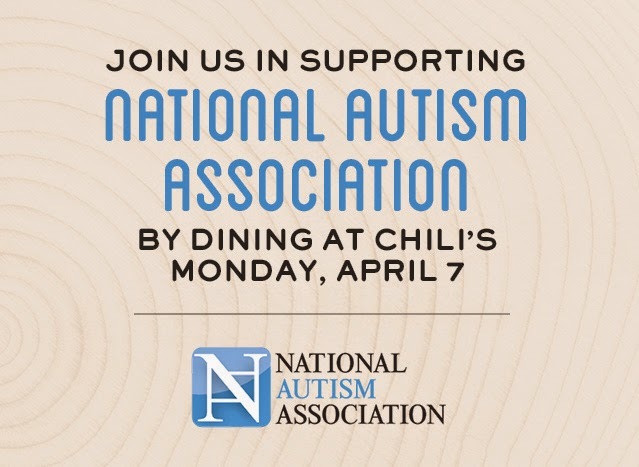 Dine with us this Monday, April 7, and we'll donate 10% of your check to National Autism Association. "The first step to change is awareness." As I said in my last post, all of us probably know someone who suffers from the "A"conditions I mentioned. If you're like me, that knowing is a like dust bunnies under the bed. I know they are there. I know I should sweep them up, and I know that one day I'll get around to it. It's not until move the bed across the floor and find a whole community of bunnies thriving in the detritus (really, where does that stuff come from?) that I KNOW the extent of the problem. To that end, President Obama has proclaimed April 2, 2014, World Autism Awareness Day. "Americans Americans with autism contribute to all aspects of society and are an essential thread in the diverse tapestry of our Nation. On World Autism Awareness Day, we offer our support and respect to all those on the autism spectrum. " 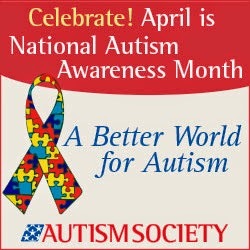 In fact, the Autism Society has been celebrating National Autism Awareness Month since the 1970s. The month of April has been set aside by the Autism Society to "educate the public about autism and issues within the autism community. " but the power of many working together is better. What can I do, you ask? Well, with the help of www.autism-society.org I just happen to have a few answers. The Autism Awareness Puzzle Ribbon is the most recognized symbol of the autism community in the world. Show your support for people with autism by "putting the puzzle" on your shirt, your car, or your FB page. Many Autism Society local affiliates* hold special events during the month of April. Check out what's happening in your neighborhood. Did you know that something that seems as simple as going to the movies is not an option for many families affected by autism? The Autism Society is working with AMC Theatres to bring special-needs families Sensory Friendly Films every month. *Autism Society affiliates are your best source of information and support. Most affiliates are volunteer-led by parents, care providers and other professionals. We have affiliates in nearly every state reaching out to individuals with autism and their families with information, support, and encouragement. Note: Most of this information came straight from the Autism Society website.